Samoyed undercoat is the most profuse and luxurious of all dog fibres. It is wonderfully strong, and being nearly white, will dye to any colour. The Samoyed owningSpinningPicture spinner is indeed privileged. 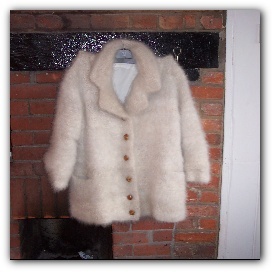 Garments made of these combings resemble Angora rabbit wool and are equally soft and warm. The undercoat may be spun as it comes off the dog, without any preparation. This, however, is difficult for beginners and it will require a very loose tension on the wheel and a high degree or twist or it will come apart as it is being spun. Also, it will have less elasticity than when mixed with a fibre with some crimp, like sheep’s fleece** and this is the more popular way to spin dog combings. 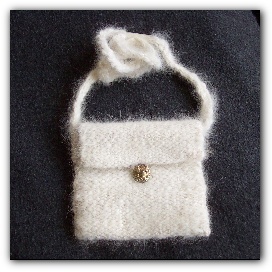 It is combined, on special “carders”, with sheep’s fleece in varying amounts. You could use half Samoyed and half fleece for a very fluffy yarn or less Samoyed as required. Plying is the process when two reels of spun yarn are twisted together in the reverse direction to the spinning, and this produces the spun yarn which will not pull to the left or right when made in to an article. The yarn is then taken off the reel and wound into a large skein, tied loosely in several places and washed in a mild detergent such as Stergene. If the fleece is used in conjunction with the dog wool it is advisable to soak the spun yarn in very hot water before washing, to preshrink it, but Samoyed wool on its own should not shrink or mat. Knitted and crocheted garments should be shaken out after each washing. They may need a slight brushing to stop the “moult”. For those wishing to learn to spin, some spinning suppliers offer short courses and adult education institutes have spinning and weaving classes. Spinning wheels vary from around £100 for an upright portable model to £300 plus for a super Saxony wheel. It should last a lifetime and requires little maintenance other than oiling moving parts and changing the cords occasionally. N.B. 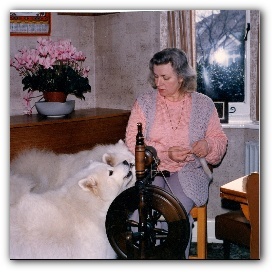 A spindle may be used instead of a wheel for Samoyed fleece combinations and this method of spinning is usually taught to beginners to get the feel of drawing out and twisting fibres. However, it is very slow and difficult to obtain a fine yarn. Nevertheless, it does have its uses and the cost, of course, is minimal. ** Suitable fleeces for combining with Samoyed combings are; Shetland, Romney Marsh, Suffolk or any of the “Down” breeds, i.e. Hampshire, Dorset or Oxford. It must be fine, with some crimp, and have a soft feel.